Interested in learning about what's new in a software release? What if you want to know whether anything has changed in a SAS product? Or whether there are steps that you need to take before you upgrade to a new software release? Note: To make the product-change information easier to find, this section was retitled for SAS® 9.4M6 and SAS® Viya® 3.4. 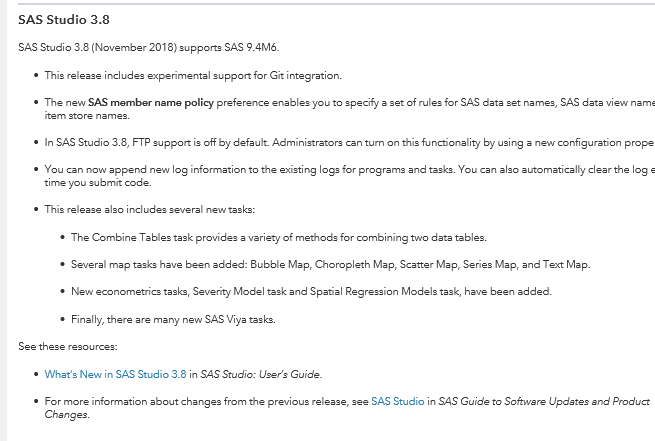 For documentation about previous releases of SAS 9.4, this section is called “SAS Guide to Software Updates.” The information about product changes is included in a subsection called “Product Details and Requirements.” Although the title is different in newer documentation, the content remains the same. What's available in each section? •	“What’s New” contains information about new features. For example, in SAS 9.4M6, “What’s New” discusses a new ODS destination for Word and a new procedure called PROC SGPIE. o	Another subsection discusses product details and requirements. In it, you will find information about values or settings that have changed from one release to the next. For example, for SAS 9.4M6, the default style for HTML5 output changed from HTMLBlue to HTMLEncore. Another example is for SAS® 9.4M0, when the YEARCUTOFF= system option changed from 1920 to 1926. 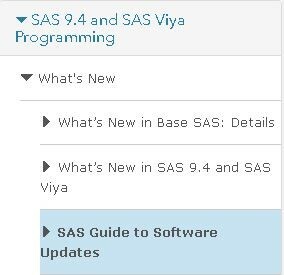 In “What's New in Base SAS: Details,” you can search by the software and maintenance release to find new features. 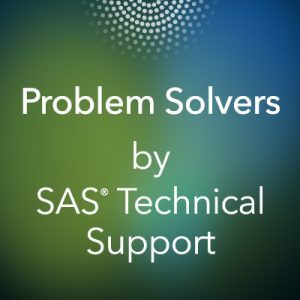 Beginning with SAS 9.4, new features for maintenance releases are introduced using the SAS 9.4Mx notation. For example, in the search box on the page, you can enter 9.4M6. With these new online Help sections, you can find information quickly about new features of the current SAS release, as well as what has changed from the previous release. As always, we welcome your feedback and suggestions for improving the documentation. Elizabeth Downes and Marie Dexter in SAS Documentation Development were very willing to make the requested wording changes in the documentation. They also contributed to the content of this article. Thanks to both for their time and effort! 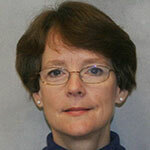 Kathryn McLawhorn has worked in Technical Support at SAS for since 1997. She started as a consultant in the Base Procedures and ODS group, and she currently is a consultant in the Foundation SAS group. She primarily supports report writing, ODS, and Base summary procedures. Kathryn has her SAS Certification in both Base Programming for SAS 9 and Advanced Programming for SAS 9.